My journey westwards continued to the end of 本州 Honshu, Japan's main island, where you will find the prefecture and city of 山口 Yamaguchi. I choose to mak a stop here, because one of my friends and university colleagues from Erlangen, Germany is doing a exchange term at Yamaguchi University. Yamaguchi connects 九州 Kyushu, Japan's west most island with 本州 Honshu, the main island. The city itself is small compared to cities like Okayama or Nara, but it has a charming atmosphere and there is a lot to see. The university is not in the center of the city, but in a small town 5 kilometers away called Yuda Onsen (onsen = hot spa). There is a legend about Yuda Onsen, that says some monks saw a white fox taking a bath and curing his wounds there. The Onsen seemed to have healing powers and ever since people from all over the country streamed to Yuda Onsen to cure wounds of diseases. Therefore the symbol of Yuda Onsen is the white fox, and he is towering over the town, right next to the station. In December 1547, in Malacca, Francis Xavier met a Japanese nobleman from Kagoshima named Anjiro. Anjiro had heard from Francis in 1545 and had travelled from Kagoshima to Malacca with the purpose of meeting him. Having been charged with murder, Anjiro fled Japan. He poured his heart out to Francis Xavier, telling him about his former life and the customs and culture of his beloved homeland. Anjiro was a samurai and as such provided Xavier with a skilled mediator and translator for the mission to Japan that now seemed much closer to reality. “I asked [Anjiro] whether the Japanese would become Christians if I went with him to this country, and he replied that they would not do so immediately, but would first ask me many questions and see what I knew. Above all, they would want to see whether my life corresponded with my teaching." He returned to India in January 1548. The next 15 months were occupied with various journeys and administrative measures in India. Then due to displeasure at what he considered un-Christian life and manners on the part of the Portuguese which impeded missionary work, he travelled from the South into East Asia. He left Goa on April 15, 1549, stopped at Malacca and visited Canton. He was accompanied by Anjiro, two other Japanese men, the father Cosme de Torres and Brother João Fernandes. He had taken with him presents for the "King of Japan" since he was intending to introduce himself as the Apostolic Nuncio. Xavier reached Japan on July 27, 1549, but it was not until August 15 that he went ashore at Kagoshima, the principal port of the province of Satsuma on the island of Kyushu. He was received in a friendly manner and was hosted by Anjiro's family until October 1550. From October to December 1550, he resided in Yamaguchi. Shortly before Christmas, he left for Kyoto but failed to meet with the Emperor. He returned to Yamaguchi in March 1551 where he was permitted to preach by the daimyo of the province. However, lacking fluency in the Japanese language, he had to limit himself to reading aloud the translation of a catechism. Xavier was welcomed by the Shingon monks since he used the word Dainichi for the Christian God. As Xavier learned more about the religious nuances of the word, he changed to Deusu from the Latin and Portuguese Deus. The monks also realized that Xavier was preaching a rival religion. With the passage of time, his sojourn in Japan can be considered fruitful as attested by congregations established in Hirado, Yamaguchi and Bungo. Xavier worked for more than two years in Japan and saw his successor-Jesuits established. He then decided to return to India. He established a church in Yamaguchi, which became the center of Christian life in the town. However under mysterious circumstances the church burned down to the grounds with the fire watch being no 5 minutes away. People say someone even called the fire watch, seeing smoke coming out of the church, and the fire fighters set out, but returned without extinguishing any fire. When they returned to the church later, that fire was so big, that the church could not be rescued any more. Later when the economy was rising and Yamaguchi had a lot of money, the administration decided to built a memorial church for St. Xavier at the same spot where the old church has stood. Next Andy brought me to the river side of Ichinosaka river, where we enjoyed some cool drinks and cooled down from the hot day. Watching the beautiful river, he told me that in early summer a lot of fireflies can be seen along the river. And the people here like them so much that they made a festival in honor of the fireflies, the 蛍祭り Hotaru Matsuri (firefly festival). Alas fireflies only gather here for mating, which does not take longer than one or two weeks. But they return every year like fished returning to their birth waters. I imagined seeing fireflies dancing on the water. It must be wonderful festival, with everyone marveling at those little insects and the moon reflected in the water below. Next Andy showed me his place for meditation and contemplation. He always goes here in times when he needs advice or a problem to overcome. But also when the stress of upcoming exams drain his energies. The temples lies quite high and you can enjoy a nice view over the city. The temple is quite famous for its ancient five storied wooden pagoda, which is standing since ages past. Despite his fame the temple is usually quite and peaceful and it feels refreshing walking around its borders. Next to the temple itself you can find burial mounds of the Mori Lords who ruled over Yamaguchi in earlier times. There is a certain spot, which produces strange echoes if you clap your hands and stomp on the ground. And here we are, the memorial park of the revolution! It was constructed 100 years after the revolution had successfully overthrown the Tokugawa Shogunate and introduced new ideals of a society of equals open to the world. The class system was abolished and a elected government was slowly created and Japan was transformed into a modern state during the Meiji Period. One of the days I was strolling around Yamaguchi by myself looking for interesting things to catch my eye. And indeed the Center Of Arts And Media can hardly evade the eye, since it is so huge and long. I wondered what it would be and approached it slowly looking for an entrance. plastic clapping started. When I followed the noise I found one record player7s arm hitting against something fixed to the empty turntable. Before I could get a close look a loud noise started and the clapping stopped. The noise came from above, so I looked upwards and realized there are even more record players, I had previously assumed. After this I relaxed for a while in a biotop between two walls of this strange building and read some in a book. After that I continued to the second floor and found myself in utter darkness. I had to think of the haunted house in Kurashiki and turned around in reflex to see if someone was standing behind me. There was nobody there. Where the haunted house was a narrow path, this place was a big open space, which made it harder to navigate, seeing nothing and having nothing to touch but the ground. When my eyes adjusted to the darkness, I realized there are people in the middle of the room playing instruments. But there was no music, only silent noise coming out of their instruments. When I got closer I realized the people were not real, they were only projections on a wall, but they certainly looked real. Even after I discovered the projectors, I wondered if some of them were still real. Even more the hall also hosts a huge library, where you can even watch movies for free. I was tempted for a moment, but then decided to continue and explore the city. Yamaguchi's biggest bridge is constructed quite complicated to offer everyone a convenient way of crossing without the use of traffic lights. Therefore now it looks like an octopus with many arms. I was lucky to hit a good time for coming to Yamaguchi. 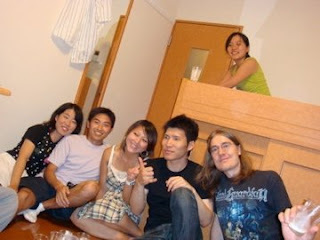 On two of the days of my stay in Yamaguchi there were parties in the evening Andreas dragged me in joining. The first was a farewell party for another German exchange student from Marburg and the second a birthday party for a Brazilian guy, which was held all in South America style with people from Peru, Brazil and Mexico. I learned a bit about South America and met some interesting guys, like a young Buddhist monk, who joined the birthday party, and who is planning to visit Brazil and help out at some Buddhist temples there. I was really surprised and questioned his story at first, but he was a real monk and his answers proved beyond doubt, that he is sincere in following the path of Buddhism. For example he told me for him, the meaning of life is to exist for others. He did not only refer to helping people, but his whole existence. Whenever he would talk or interact with someone or do something others might notice, in a way he will influence other people. So if he carefully chooses what to say and do, he can make a positive impact on people and help them grow. This promising name simply refers to the dormitory for oversea students and nothing more. Here my friend Andreas has his room. Lucky for me, this place has a big common room with comfortable couches, were I slept three times. There was a family of cockroaches living there: father cockroach, mother cockroach and two children. But surprisingly enough, after my experience of sleeping in a forest I was no longer afraid of cockroaches and had no problems of sinking into a comfortable sleep with the cockroach family crawling below me on the floor. On my second day in Yamaguchi Andy and me met Kimura-san, the woman who sold him a flight ticket back to Germany, when we were buying some snacks for the farewell party mentioned above. She talked a little to us and was surprised that I was interested in the Meiji Revolution and the characters involved to make it happen. After hesitating a bit she told me that she was heading to a learning group, which in the spirit of Yoshida Shouin tries to see in to the future and find solutions for the problems of today. And if I would be interested, she would take me with her and we could join together. After hesitating for some moments too, I accepted and told Andy I would the join the party later. Yoshida Shouin was an incredible genius who taught himself a lot and started teaching at the university at the age of 9. He had incredible foresight and predicted the course Japan would have to take not to become a resource colony to the Western World like Korea and China. His intellect and charm attracted many students to his place in 萩 Hagi and following his teachings and spirit he succeeded in basically turning a whole province rebel. 長州藩 Choshu Province was the first to abolish the class system and teach and treat everyone equal. It became a place of idealism, dreams and free thinking. And because of that it had to be stopped and the Shogun sent a punishment force to destroy Choshu. At this time they also noticed that Yoshida Shouin, who was teaching in Edo in the mean time, tried to get aboard the famous 黒船 black ships of American Admiral Pery to establish direct relations and break the Shogun's law of isolation. For that he was imprisoned. However even at prison, he quickly established a school and continued teaching with his vast intellect and memory being all he needed. Eventually the Shogunate decided to execute him. The learning class' topic today was cell phones, and both me and Kimura-san were quite disappointed. It was about all the bad changed and dangers the cell phone brought to the Japanese society. I could agree on that, but Kimura-san told me usually they would talk about philosophical ideas, Buddhist teachings and how people might be able to change society and the world, like Yoshida Shouin did. After the class before I went to the party, Kimura-san offered me to take me to 萩 Hagi, a own 40-50 kilometers away from Yamaguchi, which has been the intellectual center of Choshu Province. 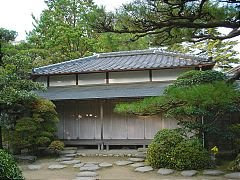 It was also the birthplace and teaching place of Yoshida Shouin, and in fact you can say that the Japanese Revolution started there. So like hell I wanted to go there, especially with a knowledgeable interesting guide striving in the spirits of this great forethinker.